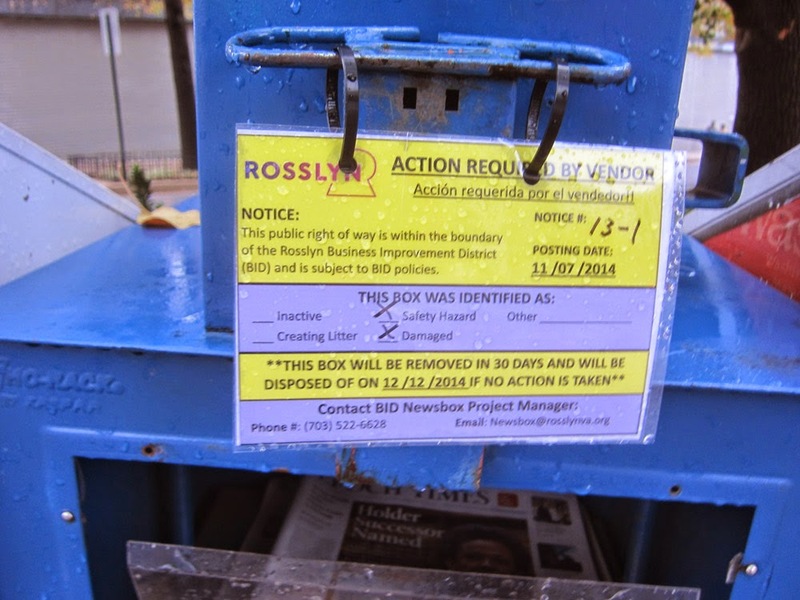 Many newspaper boxes around Rosslyn have been tagged for removal. That will give Rosslyn sidewalks a cleaner look and help to encourage strolling and soliciting about the streets of Rosslyn. This anti-newsbox initiative will expand opportunities in the traditional newspaper industry. The removal of newsboxes will encourage home delivery of newspapers. Employment of newspaper boys and girls is thus likely to expand. If you have children, encourage them to consider a career in the traditional newspaper industry. The Ode Street Tribune's publisher began his storied career in the newspaper business as a newspaper boy. If you can pry the smartphones out of your kids' hands and teach them to relish the touch of newsprint, they too one day could become editors of their own newspapers. Maybe the editor of the Ode Street Tribune should consider returning to his roots and getting a paper route so he can better understand why people still read printed newspapers. A paper route would allow the editor to physically reconnect with the public and get away from all of the electronic connections. A paper route would provide a touch of the "real world". Maybe that is why Jeff Bezzo bought the Washington Post. He also probably started as a paper boy.